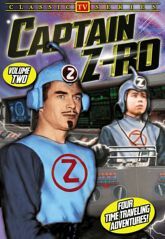 In a secret fortress hidden somewhere in the remote, uncharted regions of the Earth, scientist Captain Z-Ro monitors human history through his Time Screen. Whenever events unfold contrary to the history books, Z-Ro and his young companion Jet use their time machine to go back in time and set things right. With the trustworthy Roger the Robot and their spaceship ZX-99, the brave explorers in time and space learn that the best way to plan for the future is by learning from the past.Premiering in syndicated markets during the 1955 holiday season, Captain Z-Ro's mix of sci-fi action and educational content quickly made it "the best children's show on television", according to the Kefauver Committee on Juvenile Delinquency. Creator and star Roy Steffens (n�e Steffensen) had previously produced a 15-minute version of the program for local live TV in California. All the episodes were directed by David Butler.Unseen for decades, Captain Z-Ro has been lovingly transferred from the original 16mm prints to ensure the highest quality. DISCOVERY OF GOLD: Captain Z-Ro must stop a killer from taking credit for the discovery of gold in California.METEOR: A flaming meteorite hits the hull of the ZX-99, putting Captain Z-Ro and Jet in danger.AZTEC PAPERS: Captain Z-Ro and Jet must act quickly to save a helpless slave girl from being sacrificed to the Aztec god of fire. WASHINGTON AND HOWE: The British will win the Revolutionary War unless Captain Z-Ro can get an important message to General Washington in time.